Action feature: Code name: "Gnasher". Thrashes Its Snapping Jaws! Description: this bizarre slender reptilian creature assumes a walking posture, with its left leg and right arm positioned in a backward move and its right leg and left arm moved forward. This critter sports a greyish blue paint job for the most part: this colour is located on the animal’s back, flanks, tail, neck, limbs and head. The underside of the figure (its belly, lower part of the tail, part of the lower jaw and throat) are coloured beige. A large number of greenish blue stripes run over its back, tail, neck and head, supplying the overall creature with a bit of an aquatic look. Its big mouth sports a red tongue and white teeth, including a total of six large teeth, almost fangs; two of these stick out of the upper jaw, four out of the front of the lower jaw. The Ornithosuchus has small bright green eyes, and carries a beige JP: Site B logo with the number .35 next to it on its right upper leg. The creature’s claws are not painted in a colour different from the greyish blue. The Ornithosuchus is equipped with a thrashing action: moving the right leg forth makes the head spin round to the left. Additionally, the beast’s lower jaw snaps back when pulled down and released, making it possible for this sculpt to clasp other figures between its jaws. Ornithosuchus also comes with dino damage: it features a removable tail section, revealing blood tissue and a white pin (resembling a bone) sticking out on which the tail can be pinned back. The figure also comes with two pieces of capture gear, a small chain to restrain the limbs (though only two of them at the same time, not all four), as well as a large muzzle to keep the creature from biting. It doesn’t stop the Ornitho from thrashing its head though. Both pieces sport a shiny metallic brown paint job. Analysis: Kenner once again in a bold move decided to add an almost totally unknown non-Saurian prehistoric creature to their list of JP figures, though it took some time before it finally got a release (see ‘repaint’ section of this review). This particular sculpt turned out quite well and is much appreciated by most collectors for being both original and plain cool. The Ornithosuchus sports a fine paint job, though a bit monotonous: the greyish blue is somewhat overused, but not in such a way that it’s gotten ugly or boring. However, it’s unfortunate the claws aren’t painted. The creature comes with a thrashing action, which makes it capable of moving its head around. On its own this looks a bit odd, but in combination with other figures it gets a lot more impressive and vicious: imagine a helpless hatchling trapped between those strong jaws and being violently thrashed about the place. Or how about a human figure’s leg? This feature makes Ornithosuchus a foe not to be underestimated when encountered in the wild. The card mentions snapping jaws, however this is saying a bit too much: the jaws only snap when you pull them down and let them go, not on their own accord or in combination with the thrashing action unfortunately. Still, it doesn’t totally keep the fun out of this figure’s action features. Another option this monster sports is some good old dino damage. Usually dino damage is applied to larger figures, so it’s interesting to see it on a smaller figure like this. The damage is quite severe though: the last seven centimetres of the tail (about three quarters of the entire tail) can be pulled off, as if torn off by some ferocious bigger predator, or maybe a rival of Ornitho’s own species. Of course the designers weren’t afraid to show some blood and bone (sort of), making it look like a nasty wound from which the poor creature might not recover. Unless it’s like a lizard, capable of regrowing its tail. The capture gear is fun, but doesn’t add all that much. Unlike most other smaller dinosaur figures, this particular sculpt doesn’t feature a dinosaur-breaks-free-of-restraints action. Playability: high enough, Ornithosuchus has a full range of poseable body parts, namely limbs, head and lower jaw. The breakaway tail also adds to playability options, as does the capture gear. The thrashing action is quite neat, but hampers poseability of the right hind leg and the head somewhat. Also, the figure has some problems standing up straight because of the leg supporting the attack action. 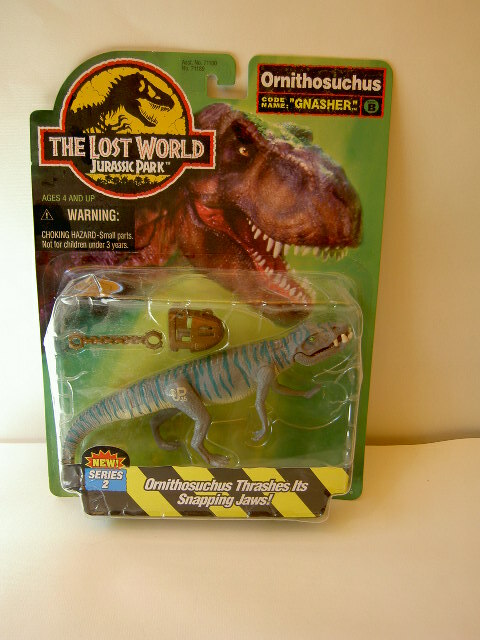 Realism: Ornithosuchus has not been featured in the TLW movie nor any of the other JP films. It is purely a creative creature on the toy designers’ part, to add some creativity to the toy line, something much applauded by the majority of JP toy fans. From a palaeontological perspective, the design of this figure isn’t too far off from the real thing. The overall size compared to the human figures, as well as the body shape are about right, including the front limbs which can be used as hands and feet, making it both a bipedal carnivore and a quadruped. Though the head sculpt resembles Ornitho’s real head, the large teeth make it somewhat inaccurate. For your information, Ornithosuchus was not a dinosaur itself but actually a primitive crocodilian, yet still a relative of the dinosaurs. Repaint: yes. This figure is a repaint of the JPS2 Ornithosuchus, which sadly never saw a release. 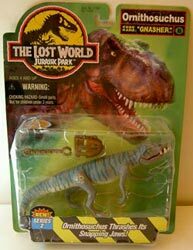 Fortunately Kenner decided to release it for this TLW line after all, like they did with the Bull T-Rex, also originally a JPS2 figure. Repainted along with it is the capture gear which came with the JPS2 Ornitho. Both the animal and the restraints were repainted for the first JP Dinosaurs toy line. 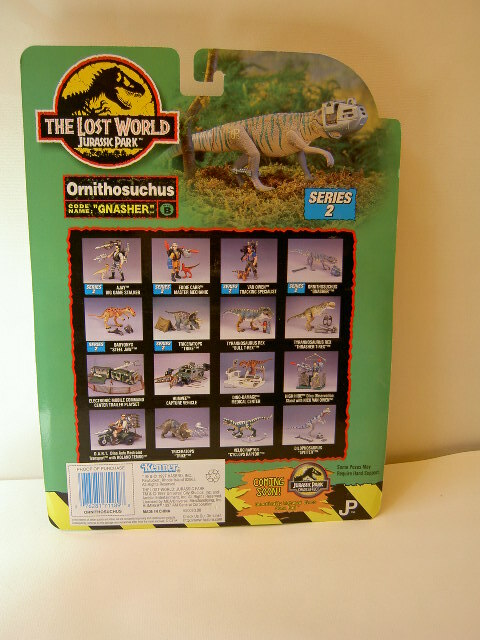 Apart from that, the capture gear was also featured in other repainted sets, including the JPD1 Dimetrodon and Electronic Dilophosaurus, as well as the exclusive JP III Dino Tracker Set. A second JPD1 repaint along with a human figure, the Ornithosuchus with Dino Trapper set, was planned to be released but was scrapped eventually. Lastly, it was also planned to be repainted for the JP Chaos Effect: Night Hunter Series line, but that entire line was scrapped. Overall rating: 9/10. This figure is highly original, has a fun action feature and a solid paint job. It may have a minor flaw or two but it’s one of the more interesting TLW figures released and definitely worth your attention. It borders on being rare though and can be hard to find as well as relatively expensive, so be warned.